After serving nearly nine years of a nine-to-33 year sentence in his 2008 conviction on charges of armed robbery and kidnapping related to a hotel-room confrontation in Las Vegas, Nevada, O.J. Simpson has been granted parole, according to CBS News. Simpson appeared to be in good spirits at the hearing, laughing and joking when Nevada Board of Parole Commissioner Connie Brisbee mistakenly listed his age as 90 years old. “I feel it, though,” he said. He also testified on his own behalf, saying he’s a “good guy” who “take[s] full responsibility“ for the robbery. He added, “I am no danger to pull a gun on anybody,” and “I am sorry things turned out the way they did,” as reported by CNN. Along with Simpson’s daughter Arnelle, one of the victims of the robbery, Bruce Fromong, testified on Simpson’s behalf, saying he felt the sentence was disproportionately harsh. 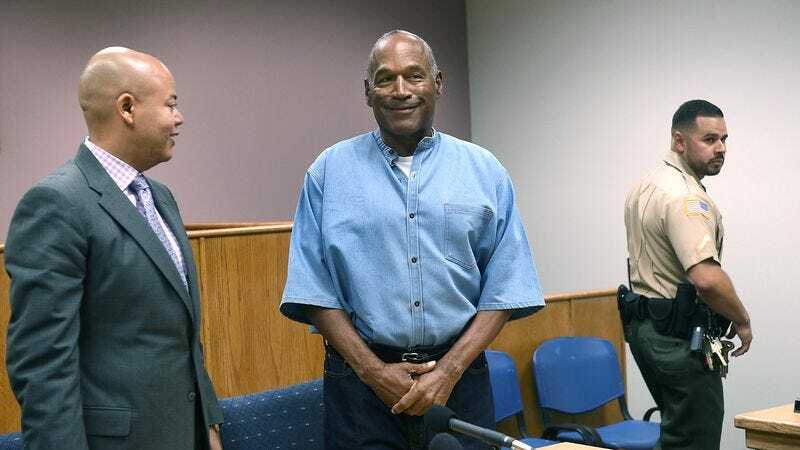 Simpson has been back in the spotlight over the past year, after two award-winning series, the Oscar-winning ESPN documentary O.J. : Made In America and the Emmy-winning FX anthology series The People Vs. O.J. Simpson: American Crime Story, were made about him. Simpson will be eligible for parole on October 1.